ysabetwordsmith | Poem: "Where We Love Is Home"
Poem: "Where We Love Is Home"
This poem is spillover from the July 21, 2015 Poetry Fishbowl. It was inspired by a prompt from moongoddessgirl. It also fills the "families" square in my 6-10-15 card for the genprompt_bingo fest. This poem has been sponsored by chanter_greenie. It belongs to the Danso and Family thread of the Polychrome Heroics series. "Where We Love Is Home"
he wished that he could do something. one afternoon, looking at Amada. especially not now with ... everything,"
but things didn't work out that way." "SPOON will cover it," Hannah said. and you're helping with my kids too. There's a fund for these situations. You can't live in a hotel forever." and I don't know what to do," Amada said. "I suppose it couldn't hurt to go look." by Rosita's disappearance and reappearance. Hannah's proposal gave him an idea, though. and throw a housewarming," Danso offered. "That's very kind of you," said Amada. of the main street, second in from the corner. the cheerful yellow house with its single garage. and a skylight overlooked the vaulted entryway. and the other two bedrooms and bathrooms beyond. space for family and kitchen and dining. and shade, all tucked neatly behind the house. It wasn't very big or fancy, and it wasn't brand new. for a young family wanting to put down roots. be easy to keep an eye on the kids. room for swingset or a sandbox." Hadyn examined the raised beds. what playthings could fit where. able to cobble up a swingset or the like. to spill out into the yard would help. everything in one house and yard. decided to move into the yellow house. to help the Durantes move in. A week later they held the housewarming. with enthusiastic help from the children. and a sandbox underneath the playhouse. a bucket swing safe enough for the babies. not to get in each other's way while playing. supper were already well underway. in an island dividing it from the family room. working on different projects at the same time. broth flavored with ancho chilis, garlic, and oregano. had diced. Eduardo made pico de gallo. helped by fetching and measuring ingredients. favorite recipes from their families. the outer angle of the kitchen island. tacos as they wanted, and a brownie. Rosita could have something new to eat. after you had to give up the old one." "Where we live isn't home,"
"Where we love is home." Recovering from a breakup takes time and support. Follow the steps to find happiness again. Choosing a house and a neighborhood will require careful attention. In this case, they're going about it backwards from the usual method, not looking at multiple houses, but instead trying to gauge whether a single option would suit their needs. There are tips for moving. This is Amada's new house. Making a house into a home means using various methods to customize the space to your personality and weave yourself into the local community. There are pictures and plans available for the swingset that Aidan builds. Although meant as a weekend project for one person with occasional help, it could easily be completed in a day by an experienced handyman with lots of help. Suburban permaculture makes use of slightly different zone patterns than rural permaculture does. Hollow blocks offer one method of creating villages. This can consist of residential houses or a mix of building types. Yardsharing allows people to combine space in ways that promote neighborhood happiness. This is one way that Terramagne encourages mixed neighborhoods; Hannah's block has traditional fenced yards and Amada's block is a yardshare, so people can travel back and forth to explore both styles. 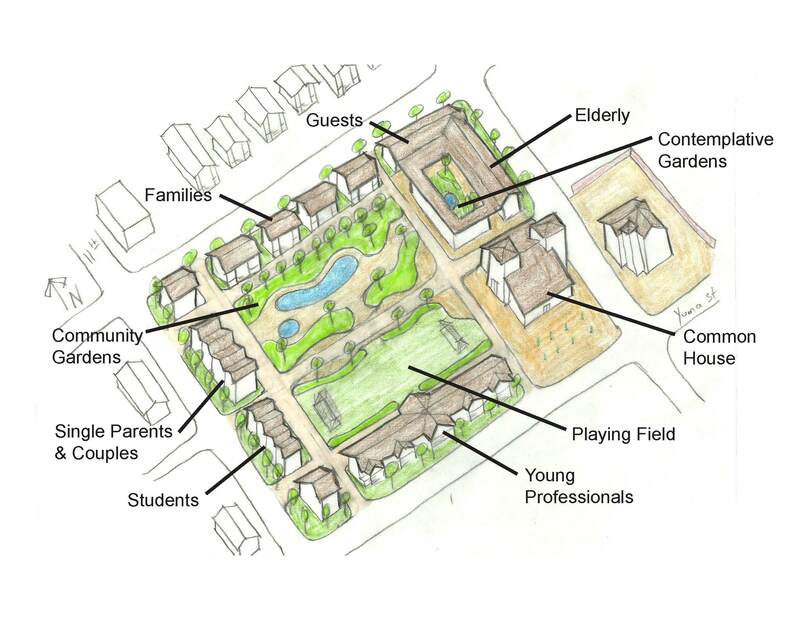 Pocket neighborhoods have their own design styles and community dynamics. Housewarming parties help welcome people into a neighborhood. Know how to host one. Pozole de Frijole is a traditional Latin comfort food. A taco bar makes it easy to serve many people. Mississippi Mud Brownies are classic Southern comfort food. Baby food depends on the child's age, but it is a good idea to introduce diverse tastes early, such as this Mexican Chicken. Where The Heart Is -- Looking Glass Folk - YouTube says something similar. And now I'm wondering if you have a Danso/Noah poem planned? Cause that thread hasn't been mentioned much but would be quite intriguing. In specific, no. In general, I know that they're interested in each other and they're doing occasional, casual teen things together. This is somewhat hindered by how busy Danso is, by his difficulty even interfacing with typical teen activities after his much-more-adult experiences, and by Noah's complicated emotions over breaking up with his previous girlfriend and her miscarriage. Some possibilities would be Noah coming over for a visit, or Noah and Danso going out doing teen things to help Danso refamiliarize himself with that kind of stuff. Also, the summer is likely to give them more opportunities since they won't be busy with school. Feel free to prompt for whatever appeals to you along that thread. There's some stuff that would benefit from further development. >>Feel free to prompt for whatever appeals to you along that thread. There's some stuff that would benefit from further development.